One Thing Learned: Before and Better! Fay Wolf Coins "Before and Better"
as “Before and Better,” as a more accurate way to view client progress. It fits! She’s brilliant. I’m guilty of it, moving X out of the picture to get the best “after” shot. Who are we kidding? We don’t live this way. We don’t live like the magazines want us to think we should live. Like Fay says, these depictions make it “look like we don’t make food or do laundry.” Even with the knowledge I have around Chronic Disorganization and my social work training my goal was to end with beautiful looking spaces. Yes, well, there is no end. These “after” photos aren’t reality. We can’t possibly live in “afters.” And it is a disservice to try to impose this belief on my clients. It’s time for a shift. This is what happens when you attend a conference with your peeps- you get better. 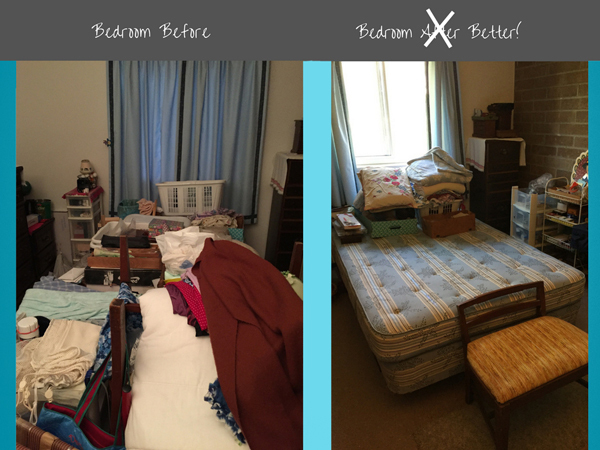 Less clutter creates less stress for many of my clients (not all.) It is time to embrace more of the internal transformations, which are more important and can’t be seen.